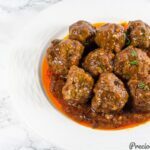 I should really call these West African and/or Central African meatballs because not all of Africa makes meatballs like this. 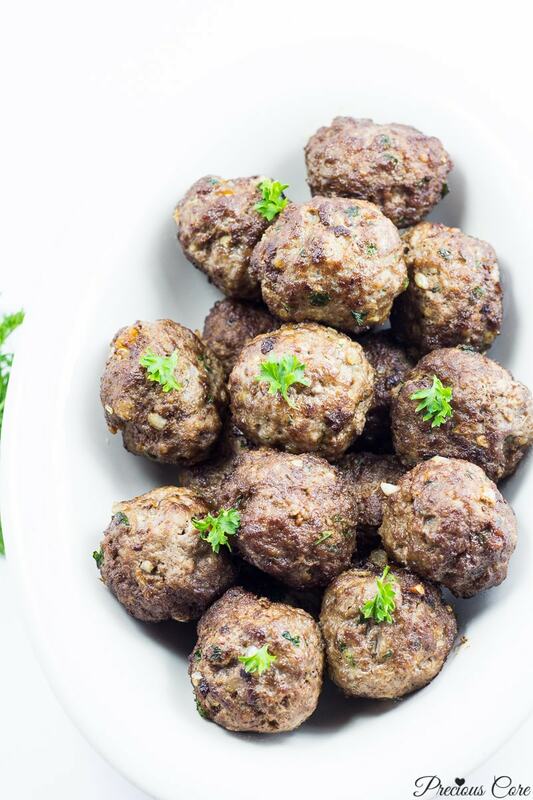 Now that we have that out of the way… meatballs yummmm. 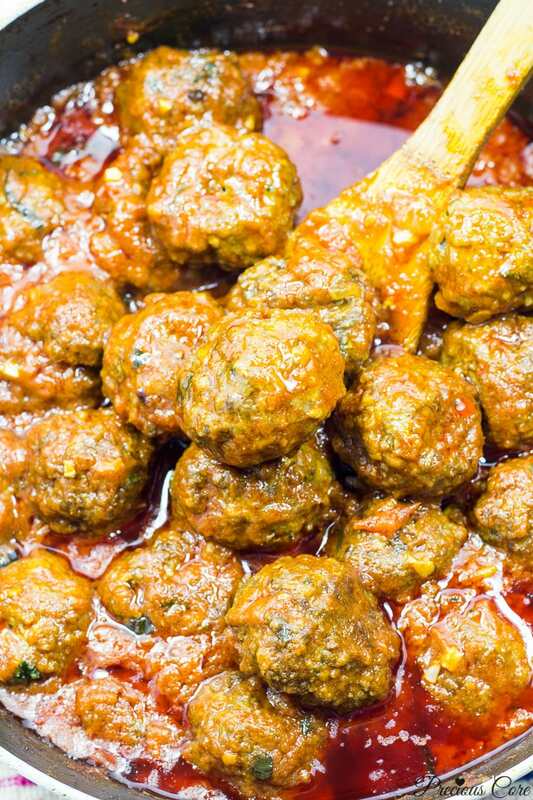 There is something you must do as soon as you make the first batch of these meatballs. You must grab some and fit into your mouth (translation: eat them). And this you must do when these meatballs are still somewhat hot. They are epic in every way. 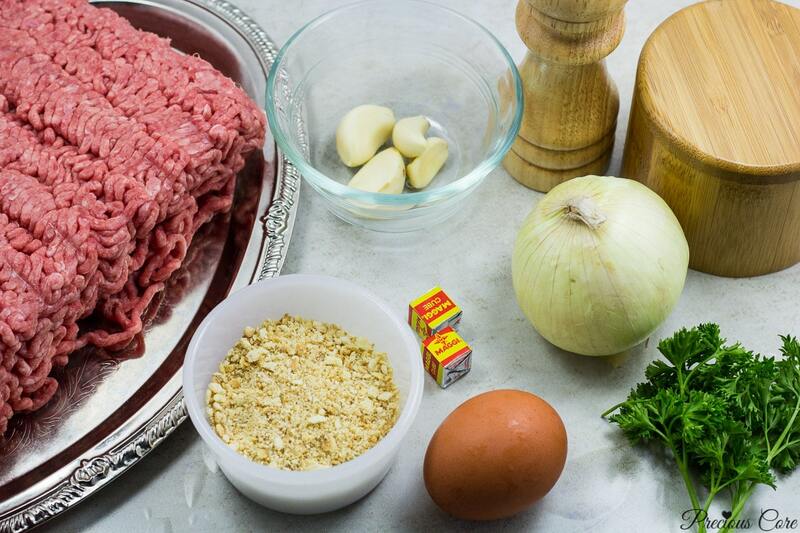 Some nice ground beef, garlic cloves, egg, seasoning cubes, onions, parsley, breadcrumbs, salt and, white pepper. Now let me tell you something about breadcrumbs: you could substitute with crushed butter crackers. They are amazing! 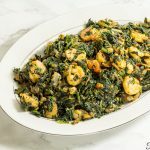 All you need to do is chop your parsley, garlic, and onion then dump all the ingredients into a large bowl. Mix them until they marry completely. 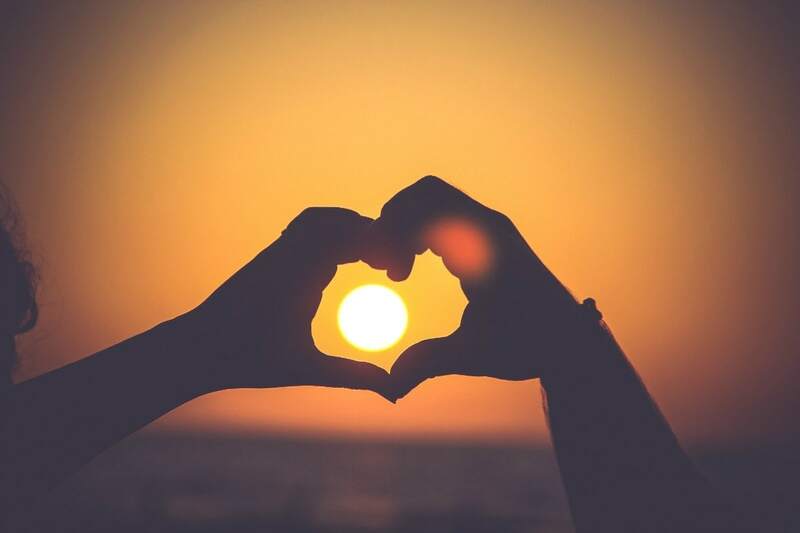 Talking about marriage, I am thrilled by how much yesterday’s post inspired you guys to have better marriages. We do not want merely okay marriages just like we do not want merely okay meatballs! Okay, I use an ice cream scoop to scoop out portions of the mixture evenly. You could just use your hands and mold into balls directly if you want. Now heat up some oil and fry away, baby! 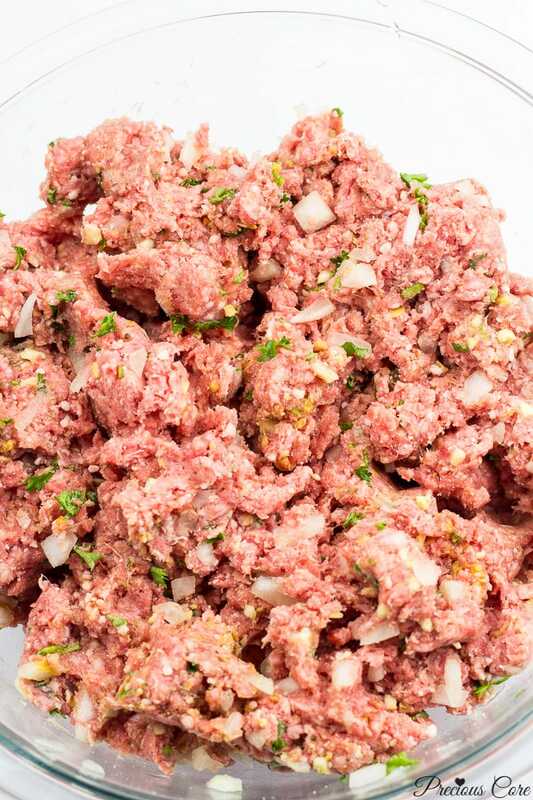 The meatballs are ready when they are no longer pink in the middle. They should be brown to the core. Remove them and place on a paper towel. This is the point where you should absolutely make out with a meatball or two. They are divine! Now, these are amazing but the magic doesn’t end there! 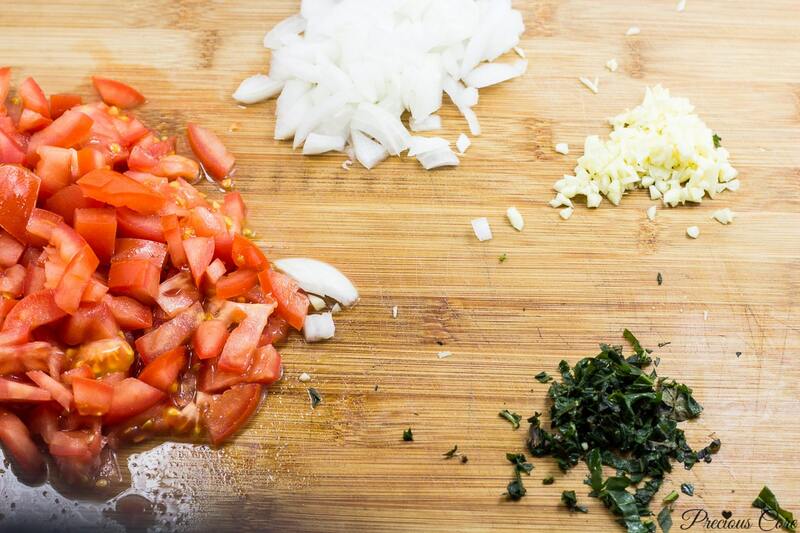 Chop up ingredients for some tomato sauce. The key ingredients here are tomatoes, garlic, basil and onions. 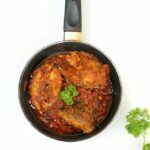 Then saute, simmer and season to perfection (no worries, all details in recipe below). It even gets better. 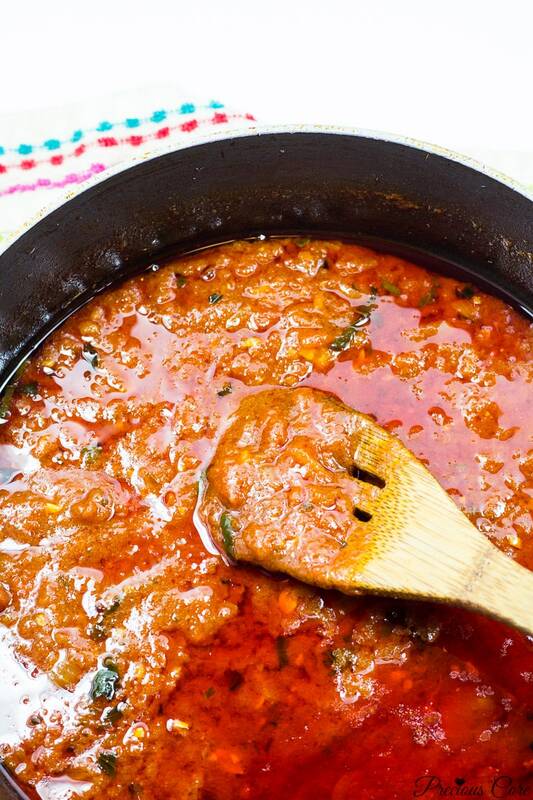 Dump your meatballs into this and simmer together. Oh my! Who wants some meatballs?? Any boiled pasta of choice – my favourite is spaghetti! 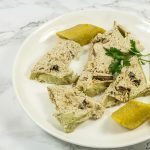 Bread – it will make the perfect sandwich with this milk bread! Meatballs, how I love thee! 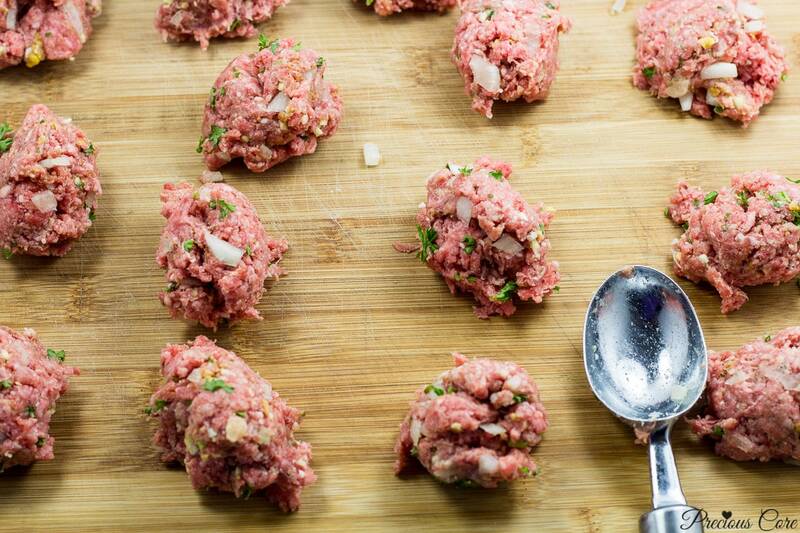 These are meatballs made with minced garlic, onion, breadcrumbs, eggs and a hint of white pepper. They are epic in every way. Make them with this tomato sauce to get the whole experience. 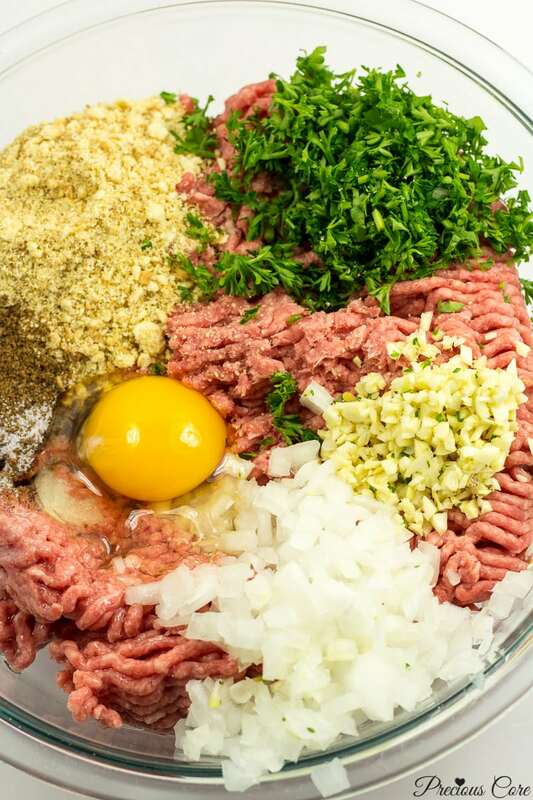 Put all ingredients for the meatballs into a large bowl and mix until everything is well incorporated. Scoop out the mixture with your hands or with an ice cream scoop then mold into balls. To make the balls easily, wet your hands and repeat as needed. 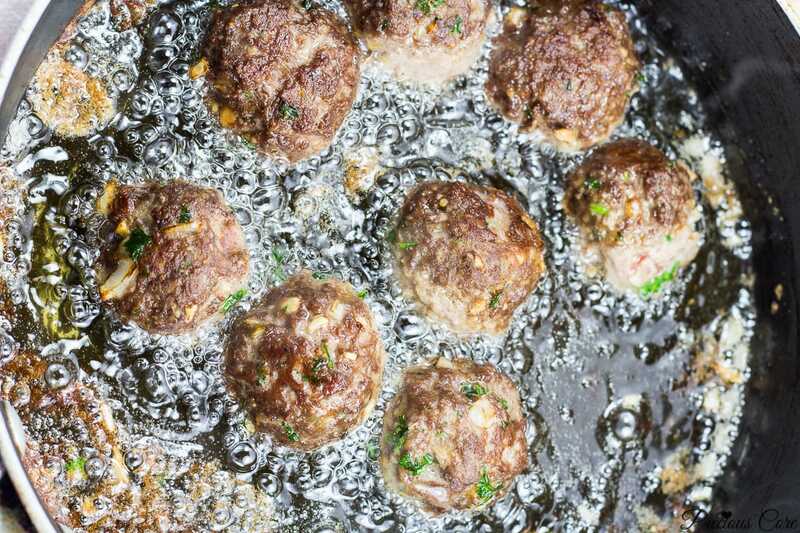 Heat oil in a pan on medium high then put in the meatballs to cook. 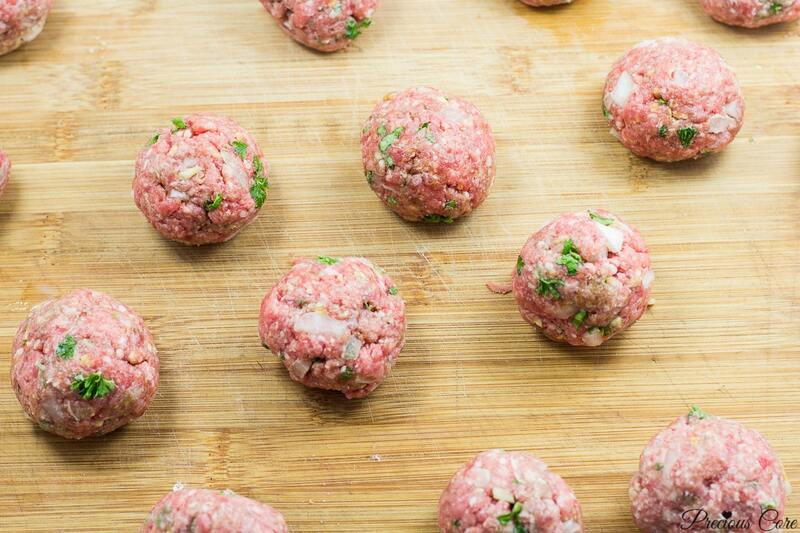 Turn the sides from time to time for about 10 minutes or until the meatballs are thoroughly cooked. The balls are cooked when they are no longer pink but brown in the middle. Pour out some oil from the pan, leaving some for the sauce. Saute onions until fragrant then add in chopped tomatoes and cook until dehydrated. Add in tomato sauce then cook together stirring from time to time for about 15 minutes. Add in garlic, basil, salt and seasoning cubes (Maggi) then cook together for another 5 minutes. Add water as needed to adjust the consistency of the sauce. Add meatballs to the tomato sauce and stir well making sure the sauce coats the meatballs. Then let them simmer together for another 5 minutes. Go ahead and enjoy your life! 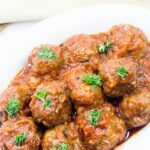 Meatballs in tomato sauce could be eaten with any boiled pasta of choice, boiled rice or bread (pssst they make the perfect sandwich filling). Enjoy! 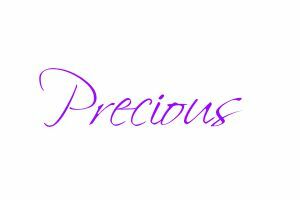 I’ll love to have you follow me on Instagram @preciouscore. If you make this recipe, take a photo and tag me on Instagram. I’ll love to see! Oh yum!!! !Chai this is life for a meat lover like me. These look so gud.I’ve always wanted to bake them instead of frying.Do you have any idea about that? Love the way you play with the words. Yes dear, you could definitely bake instead of frying. Just pop into the oven and bake till they are done. Oh my dear Precious I want some meat balls too mbok. Hopefully you get to make some, sweetie. 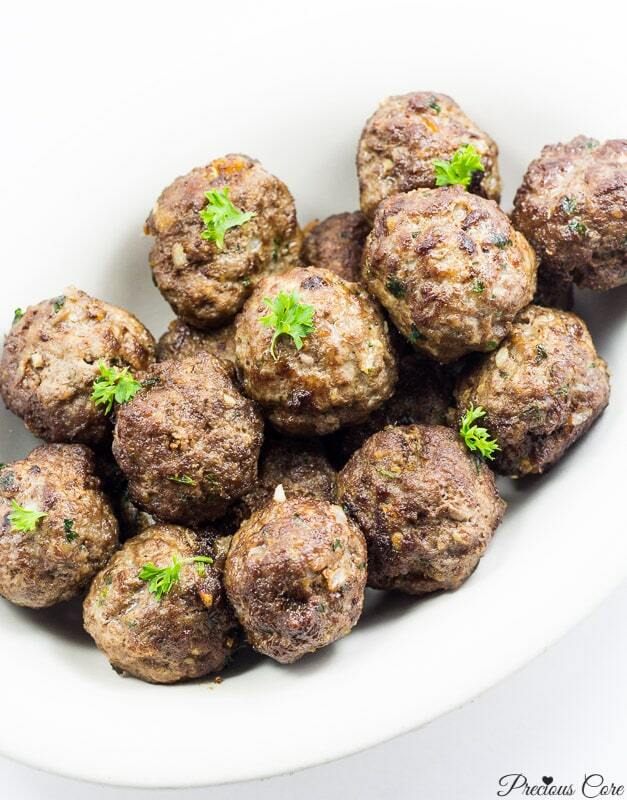 These meatballs are amazeballs haha. I would totally choose baking them over deep-frying them so I can form #TeamFit-fam small lol. This may be an ignorant question but pray tell; would baking make them firm enough like when deep-fried, so they do not ‘scatter’ in the sauce? Your food photography skills worry, no be small! Hahaha try form #Teamfitfam small. I’m sure they will hold well when baked. But I’ved never baked them before. So I would say add one more egg just to be sure. Hmmmmm. 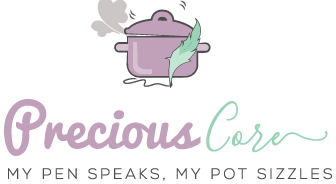 can i count the times i check recipes here…. Awwww D, this makes me so happy! Keep enjoying the jolly ride! Why did I open this post this early morning! Precious why did you do this to me? Very yummy looking recipe, I want! I’m making when my kids come back from hols break. Lol sorry dear! I’m sure your kids will enjoy it. My daughter said, “this is the best meal I ever had!” They had it with boiled spaghetti. Nice to “see” you, dear. Hi Illonda, the Maggi cube I use is neither chicken nor beef. It is smaller in size than the flavoured ones. 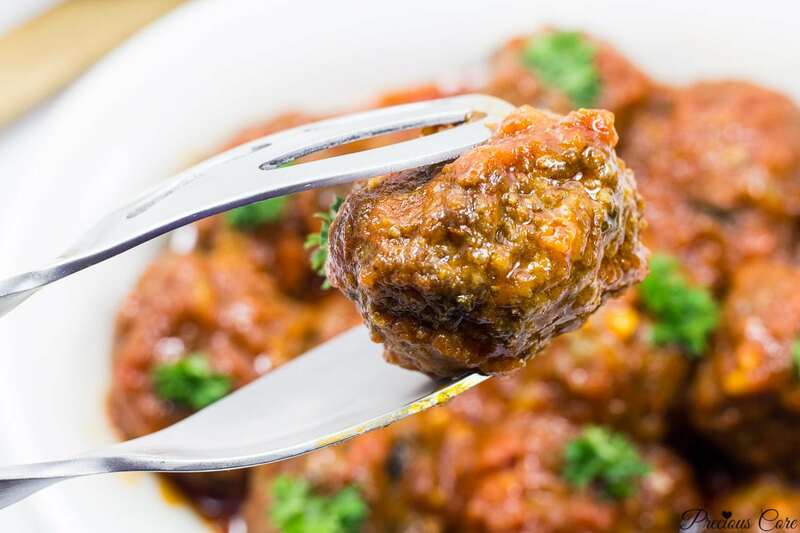 You can buy it from the African isle in Asian stores or you could substitute with a teaspoon of chicken bouillon powder – and your meatballs will still taste great! Hope this helps. bonjour precious porrquoi les miennes s’ecrasent toujours? 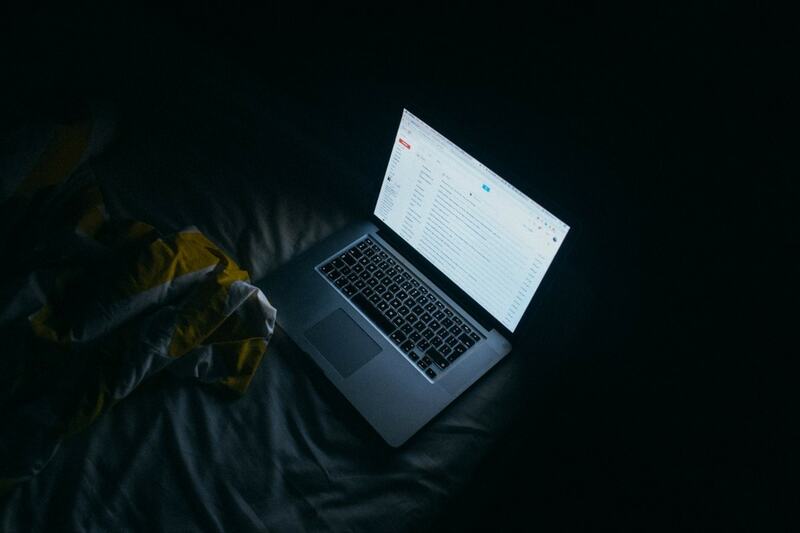 Hi Bertille, please follow my exact measurements for best results. 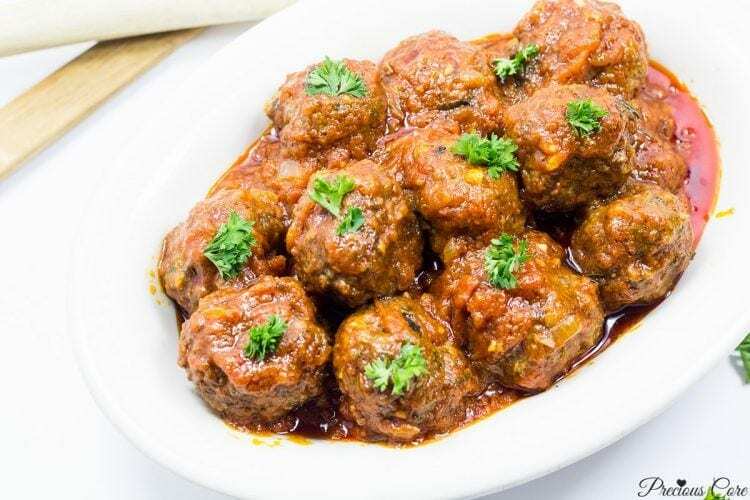 Wow I love meatballs but never tried doing it myself thanks for the recipe it will guide me do mine.Its so awesome!!!! Awww you are welcome, dear Patience. Thanks dear aleast i hv learnt sumtin 4rm u free of charge . I hope when am going to do mine it will be perfect like ur own meatballs. I hope so too Glory. Just follow my exact instructions and you should be fine. Please let me know how it goes. Thanks for your delicious meal. It comes with a great relief. I appreciate it so much. 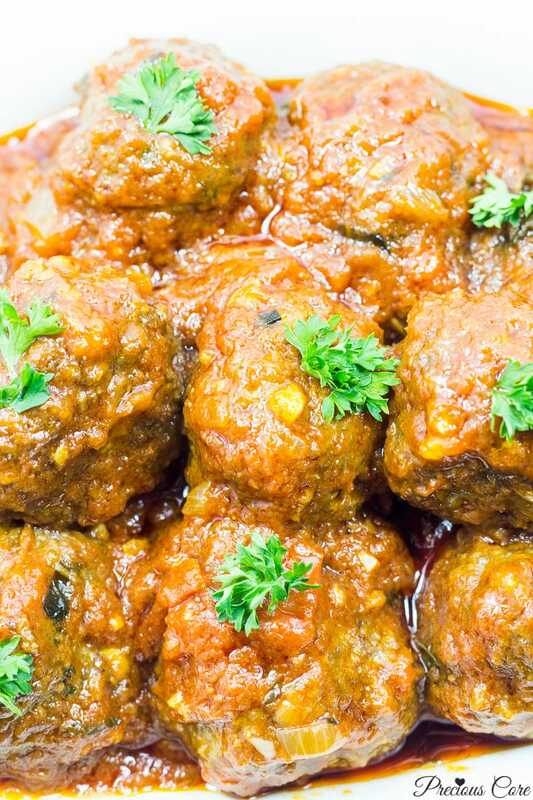 Looks nice & Yummy i like meatballs i am going 2 try this receipe tnx. Please let me know how it goes, dear. Enjoy! For someone who doesn’t like food from the fridge, that was something. Thanks keep it up. You’re impacting on us. Wow, this makes me so happy, sis Claudine! Hope you kept some in the fridge for your sweetie. Please greet the girls for me. Thanks so much for the feedback and the love and support! Awww, thank you so much, Telma. So glad to inspire you. Looks yummy bt Where can i get bread crumbs in bamenda?? Is it d local bread or??? Hin Lum, you can get breadcrumbs by simply heating up old bread then crushing it into crumbs. Hope this helps.